Supporters of the I-65 Kennedy/Lincoln bridge in Louisville said $1.3 billion widening project critical to the economy of greater Louisville. But two years after its opening, drivers aren’t using it. The number of vehicles crossing the Ohio River on I-65 daily has decreased by 49 percent, new data [PDF] from the state of Indiana shows. Turns out, local commuters and truckers don’t think the $1 toll is worth it. Traffic has fallen off on the new bridge, but has surged 75 percent on the old US 31 Clark Memorial Bridge, which remains free. The I-65 bridge replacement and widening was part of a larger $2.6 billion highway mega project that included the construction of two new bridges, jointly funded by the states of Kentucky and Indiana. But there were plenty of warnings that the project was overbuilt and ill-conceived. The state of Kentucky had to issue almost $800 million in bonds for the project at a Baa3 credit rating — one grade above “junk” status. 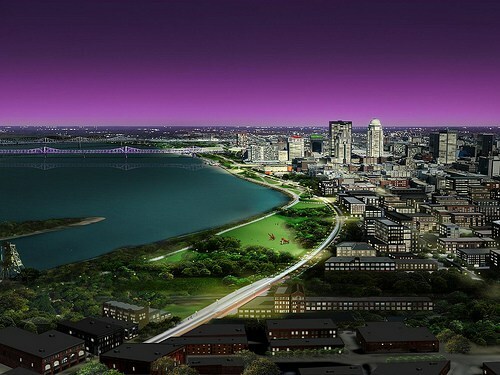 In addition, there was a lot of public opposition — especially to a portion of the plan that called for rebuilding and expanding I-64 along the waterfront near downtown Louisville. A grassroots group called 8664 campaigned for the state to instead tear down the highway. The idea was popular; 11,000 people signed petition supporting the idea. But the two activists who led the effort — J.C. Stites and Tyler Allen — told Streetsblog in 2013 that they were “crushed” by the opposition. “If we didn’t build this, we would become the bottleneck for the Southeastern United States,” project spokesperson Chad Carlton told the New York Times in 2013. Kentucky’s then-governor, Steven Beshear, was another supporter. Instead of the teardown, the state forged ahead with an 18-lane highway separating the up-and-coming NuLu neighborhood from the waterfront. Part of the project was the reconstruction of an enormous “Spaghetti Junction” occupying acres and acres of potentially valuable downtown land. It’s really a tragic story. 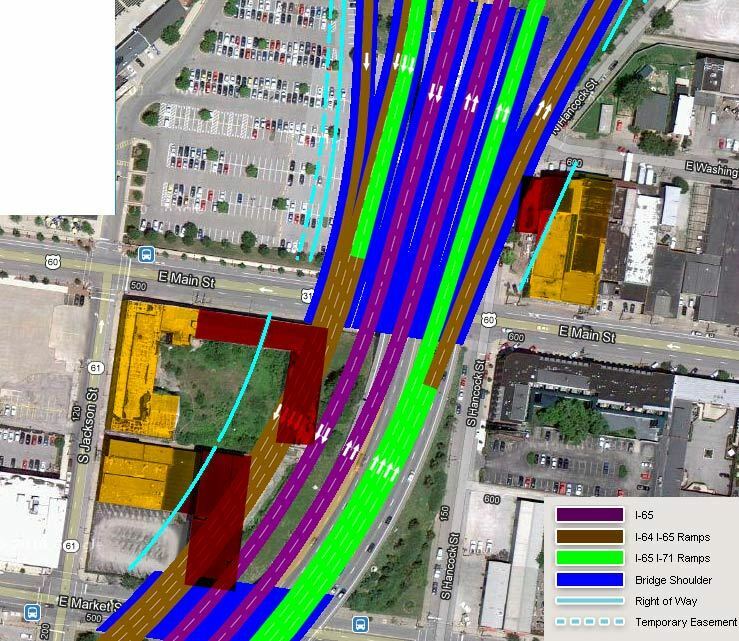 “The physical gap in the urban fabric brought about by a 280-foot-wide, 12-lane Interstate highway slicing off Louisville’s most vibrant urban neighborhood — Nulu — from Downtown is sure to be felt as the city continues to push for a livable, walkable, urban core,” Louisville urbanist and architect Branden Klayko wrote on his blog Broken Sidewalk the day construction crews began leveling historic buildings to make way for the widened 12-lane highway. jcwconsult loves it though. So there’s that. I see the south is still at least 50 years behind the rest of the world as usual. So? Why is it Louisville’s problem if freight can’t move efficiently from Chicago to Atlanta? It’s a city; where people live, visit, work, play, etc. And that quote reduces it to some mere chokepoint for truck drivers and global commerce. It’s gross. I wish this were limited to the South. We’re fighting the same fight (and losing) in Portland, OR where they want to widen the I-5 freeway right smack dab through the central city. Think he will comment his adoration of how well this series of projects has worked out? Same BS is under construction in downtown Macon, GA right now. Overcompensating for an already manageable amount of traffic. There is no money for infrastructure repairs because the politicians are busy spending billions on projects like this. If the toll was only a dollar, we’d use the bridge. On a side note: why is it that we’ve got elevated highways through our top 100 cities yet if anyone ever suggests elevated railways – which are efficient, relatively cost effective – heads explode? 1) Most brand new toll roads (like the new bridges in Louisvile) in the US receive a BBB- rating because of the uncertainty about traffic and construction risk. Once they open, start collecting revenue and paying down debt they are generally upgraded by the rating agencies. There is no red-flag about the project being a boondoggle based on the rating. 2) The two existing toll-free bridges and the brand new East End Crossing picked up all the reduced traffic on the downtown Kennedy/Lincoln bridge—total trips are nearly exactly the same now as four years ago. However, significant amount of traffic are diverted away from the downtown core where congestion is significantly down. And this is a fiasco why? 3) Prior to the project, the old bridge network was nearly at capacity, and downtown Kennedy bridge was a death trap, and there a missing movement on the east side of the metro area that forced massive tractor trailer traffic through downtown. All these problems are fixed and paid for by the users of the two tolled facilities (Downtown and East End bridges). That’s bad too? 4) This is the first tolled facility in the Louisville area—trips are bound to fall off slightly on a newly tolled bridge (the old dangerous Downtown I-65 bridge was free) as users reduce unnecessary trips that they otherwise would have taken. Again, that’s a bad thing? Forcing drivers using expensive bridges to internalize the costs of their trips? Let’s tell the whole story instead of selective use of information on a smear campaign. Hi Kevin @kevin m I agree with on ALL of this but with you most on pt. 2. I like that the two other bridges have taken the traffic from this new bridge because that means that it was worth the $ (it was supposed to reduce congestion and it has). I saw some before and after photos and even though there weren’t offramps in downtown Luoisville I am glad to hear the congestion is reduced as well. I think downtown should prosper with the addition of the I-65 brirdge and I think other people should too. Lots of times downtowns are better with highway overpasses nearby. Last point: I don’t remember where I read this but I read an article that humans do not enjoy living too close to a body oif water, so the buffer should be a good benefit for the “NuLu” area. Kentucky is a fairly poor state doing its best to stay poor. The theory that the only way across country is through downtown Louisville is pretty whacked. I highly doubt you remember that correctly, as waterfront real estate tends to be some of the most expensive around. I will say, however, that the Ohio River tends to flood, and anything closer to the river than what homes exist now frequently finds itself underwater. That’s why all the scrap metal yards that used to stand by the river were replaced with park and not more houses. This is one of those “hate your cake and reject it, too” scenarios. If traffic falls after the project, the streetscrowd says you didn’t need the project. If traffic doesn’t fall, the streetscrowd say the project just induced more traffic and you didn’t need the project. Where’s the consistency? I’ll add to your list of factors the wretched state of the Sherman Minton (I-64) Bridge, which was suddenly closed for something like 18 months in 2011 and 2012 for emergency repairs, during which time crossing the Kennedy took more than an hour. That bridge is still in rough shape and could find itself suddenly closing at any time, and eventually there will have to be some significant project to fix or replace it. Watch what traffic does on the Kennedy-Lincoln bridges then. The real estate is likelyh the most expesnvie because it keeps flooding and getting washed to sea. If what you say about the Ohio River is correct, then it’s good too they built a bigger barrier between the people and the waterfront parks becasue it COULD (not definitely though but likely) be a bad situation if people were enjoying the park and then washed away to sea. To point 2, if the goal is to reduce traffic the city could have easily invested in public transit and creating safer biking conditions. I realize Louisville is not an incredibly dense city but this money could have been used for transit. Aw Wow this looks like a tremendous opportunity wasted coupled along with a tremendous ugly looking boondoggle. So. Might as well demolish it now. It’s *still* cutting Louisville off from the waterfront. It’s obviously useless. They’ve wasted $1.3 billion dollars — that’s down the drain — now it’s time to make the right decision and 86 route 64. That’s ridiculous. The highway is a barrier to people, but not to water. Seriously? I-5 through Portland should be demolished. Make it happen. 205 and 99E are the through-routes, I-5 is an irrelevance which just makes a mess. And if you’re concerned about flooding, impermeable surfaces is not the way to go. By my count, there are a 10 highways and super highways in and around Louisville. For a small potatoes city. Wow. Political graft? Follow the money. Do you think they shouold have built the highway out of grass or something? I don’t know if I’ve seen a model like this out there but it might work? Should we build awall under the highway to block the water? That might make it harder to get to the river. I’m suggesting that paving over land that’s already prone to flooding results in more flooding. That’s one reason why Houston was so bad. Freeways in cities are a bad idea to begin with, and building them by waterfronts is particularly foolish. Not much call for visitng Lullvull anyway. That’s why the project to whisk travelers THROUGH the town post-haste, is a worthwhile project. Louisville is nothing more than an annoyance between St. Louis and Cincinnatti.